I just finished wiring this madly wicked project up, and I am so grateful to finally having it spit audio out of my speakers! I wired the red (5v+) and black GND power cables up to my arduino uno and grounded pins 14 and 10. I managed to solder some wires onto the W/R heads (checked for the GND line with my multimeter - one didn't have any resistance so I figured that'd be the one). I then ended up with somehow screwing up the motor and now it is jammed and just sends out clicks when trying to rotate. I doesn't matter that much as I already have another drive ready for hacking. This time I will build it into a casing and have switches for the different controls as direction and record/play, LED's for indicating write protect, track 0 and disk presence. But I would like to find out how to adjust the spindle motor speed before throwing myself into the hellfire of soldering and wiring once more. I tried soldering a wire to one of the pins going to the spindle motor circuit board, on the pin that got the motor running when grounded. But it wasn't the right one. The Floppy Drawbot Dude said he measured a 1 MHZ pulse on pin 5, which he cut the connection to and added his own pulse. Sounds über-neat and that's definately where I'm going! Last edited by Paleorama on Sun Oct 14, 2012 6:50 pm, edited 2 times in total. Yeah, this looks great, I'd love to hear more about your speed experiments, I've yet to see a well documented approach to it that is applicable to the drives I've seen lying around. It may be that different drive companies used different approaches to getting the spindle speed right, but it would be super cool if there were a simple solution that could be implemented in a majority of drives. does the platter spin up when you ask it to over the interface? If not then you need to either pin down one of the disk detect microswitches, or fake it by forcing the correct i/o line high or low. When you can get the disk to spin up reliably, then look for the control signal. If you don't have a scope, what I'd try is taking a 2k resistor and connecting each of the lines via the resistor to ground. When you find a line that stops the platter moving, you have a candidate. Check the rest to be sure, because one of the lines will probably be a signal to start/stop the motor. Another way to find the line is by looking up the driver chip and then tracing the tracks. Hope that helps, and let us know how you get on! I tried measuring the wires on the 'spindle motor pcb' going to the larger pcb and I wasn't sure which configuration I had to adjust my voltmeter to. I didn't find any signal amongst the pins, but one of them sent the spindle motor spinning when grounded (pin 4 from the left) but I wasn't able to do anything useful. I think I was close but... no cigar. He's using a 5.25" drive, which includes a potentiometer for controlling the motor speed. I've heard that a lot of these drives includes this function. So it has to be quite straight forward to figure out how to implement this on 3.5" drive. Of course it depends on ones skills and understanding of circuits. I'll be staying in touch with the Drawbot-guy untill I get this right. Soon I'll build the next one. Of course I'd really like to include a pot for motor speed. It would be so unimaginably sweet! I think I've read that the 5.25" drives only varies the speed between 300-360 bpm which isn't much fun. 1. Adjusting spindle motor speed. 2. OP-AMPS for in/out signals. 3. 555-timers for the stepper pulse. 4. LED's for disk-detect/write-protect/sector 0 - maybe even with female banana outputs for CV control. 5. Adding a mechanical rotary counter to the spindle motor wheel. 6. Switches for rec/play, drive I/O, motor I/O, direction etc. 7. Building it all into a casing. Glad to post it, I am getting a kick out of the idea of changing the front page a bit more often, and it's great to have enthusiastic people posting new work. I love the idea of a mechanical counter for spindle rotations, that sounds very satisfying, although expensive! :) I would be psyched to support your work on a product and provide a place with oml to help you to get it out there, I've been learning a lot about product design from my work with Keith McMillen lately, and I feel like the ultimate end goal of it all is to be able to help others learn similar things, so that we can all contribute our ideas and excitement to the greater good. Plus I've been stalled in my work with floppies as I have been sidetracked with other things, so if you are psyched to make a stab at it, it will get me psyched again to start getting things together. Regarding speed, I wonder about whether or not you are right, if maybe there could be a place in 3.5 inch drives to put a pot, just like in the 5.25 inch drives. It is definitely worth investigating. If you can post the info on the drives you are looking at, I'll look through my drives and see if I have something similar, it would be interesting to be looking at the same hardware with someone. They all seem so different. When I was at maker faire with this project, I met this guy who seemed to have first hand knowledge of so much of this drive lore, and then Jeri Ellsworth walked by and said hi (which was very exciting), and someone else was there trying to talk to me, and I quickly wrote down the man's info on a piece of paper and haven't been able to find it. A bit of bad luck there, he was fascinating and deeply knowledgeable. Jeri's main comment was that so many people have asked her to put out a board that there was definite interest and that I should get a board out for people. And then all this time has passed and I haven't yet done so. Well, I didn't know the first thing about designing a pcb at the time, but now that I do (how fast time flies and knowledge multiplies!) it all seems like it would be so simple if I could just put in the time. So if you're interested, maybe we could start drawing up and sharing schematics of workable circuits and then pick and choose from them and lay out a board. I've got a few things already drawn up and just need a bit of a push to get them to be usable in first rev form. So anyway, if you've got enthusiasm, I've got knowledge! If you're still in the midst of it all, we can compile our knowledge together and get something permanent made before you finish and move on to other projects! :) Outside of the forum you can mail me at mcanulty@openmusiclabs.com. But posting as much as possible on the forums is very valuable, people do find the post and learn from them. It's good to see that the enthusiasm "infects" (guess it's common in danish everyday-speech) and I know how it can feel when once you took the time and learned the basics of a project and went off a side track, then someone sees your project layout/prototype after some time and starts getting these rushs of creative ideas and new takes on the subject. It can only be mutually inspiring! And that's why I love your forums here, it lets people follow the progress amongst the other users and thereby taking it step by step themselves. I've been looking at this project for 2 years now and I just couldn't figure out what it all meant. And Jeri's video was just a mystery (as the girl, I guess ;)). I'm being told that I'm good at explaining things in an easy and understandable manner, but I think the main issue on this project is, as you rightly mentions yourself, that there's a lot of different drives out there. The IDE cable is fairly common wiring, the heads is a little bit more trial and error, the pin for spindle motor speed is all up to the floppy controller IC - it must be. But we'll see soon. As goes for the mechanical counter, I ripped it out of an old dictaphone (casette tape, that is) when trying to wire up the heads and got the idea as sent from above :) And I have good sources of cheap electronics around the web and my town here in Denmark. It shouldn't be any head ache. Last edited by Paleorama on Sat Oct 08, 2011 9:09 am, edited 1 time in total. 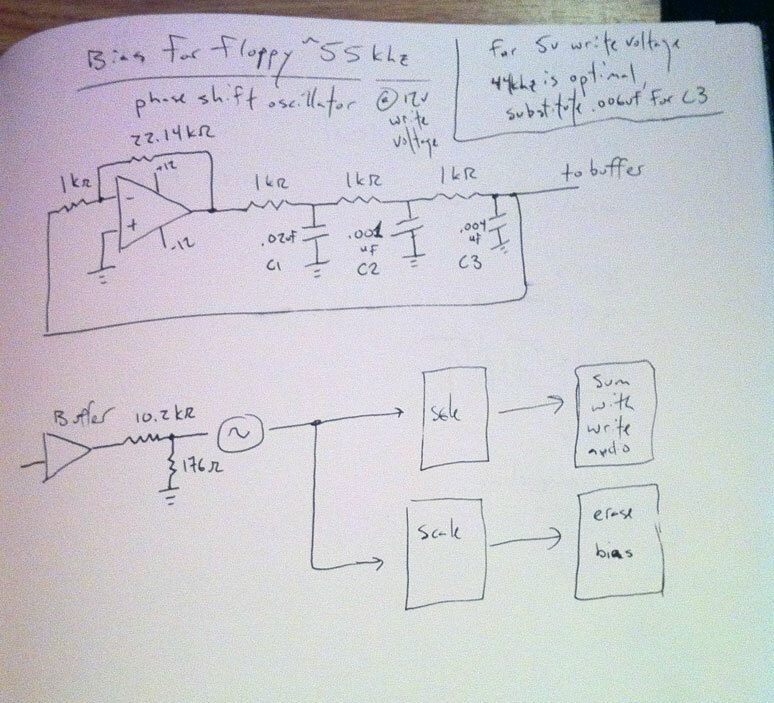 And for the ultrasonic sound to erase the disk, I wanted to build some simple circuit, based on 555/556 timers and came across this schematic on a dog-repellent project. Yeah, you could probably get rid of all those transistors if you wanted to and replace them with an lm386 if that would be more comfortable, and you should only need one 555 I think, although I am not very skilled in their use so I'm not sure why they wanted two here. You could also use an arduino to generate a 40khz squarewave and knock the edges off of it with an rc filter. I used a phase shift oscillator, which might have been overkill. Here's the page from my notebook with the bias schematic drawing I made at the time, which hopefully is not more confusing than it is helpful. These days I would probably set up the arduino or the 555 to generate a square wave and then filter it into a sine wave. The issue I remember with the phase shift oscillator was that it sometimes didn't want to get going and I had to give it a kickstart with my finger or by yanking the feedback resistor and putting it back in. But it did make a very beautiful sinewave. One thing to watch out for that I forgot about is that when you are summing the bias and the audio, you want to avoid clipping in the final output stage, so remember to leave room to scale them. I buffered the bias and then stuck a pot after the buffer so I could dial in the right scaling while developing. Those two resistors after the buffer stage are a scaling stage, I can't remember why I wrote down that I was putting it through another scaling stage immediately afterwards, it might be because I was actually amplifying the bias when I was erasing, and then just adding it when I was writing audio, so I split them into two stages. Thanks for the blueprints! I'll look deeper into your schematic when I get to that part - I'm still doing the research on the spindle motor and I think I've got jackpot! This link provides us with pretty much everything we need to know! ..of course, no two drives are completely identical - he used a NEC FD1231h 3.5" FDD. But he provides us with a very nice detailed explanation of the wires going to the spindle motor PCB and some datasheets for deciphering the IC.